IN EIGHTH CENTURY EUROPE, two vastly differing worlds exist with the Frisians, Saxons and Danes above the rivers and the Franks below the rivers. They are soon to clash in a bloody and terrifying battle for survival where no quarter is given. Determined to conquer the entire European continent, the Franks have a new weapon to overthrow the heathens. Christianity: a weapon used against non-believers, forcing them into the Christian faith by renouncing their former beliefs and forsaking their traditional gods. The Franks are attempting what even the Romans failed to achieve in taking over the North of the continent and they have set their sights on the territory ruled by the Frisian King Aldigisl (Huub Stapel), who lives in the village of Dorestad. The king's son Redbad (Gijs Naber: Tulipani) is in love with Fenne (Lisa Smit), but she is among the maidens to be sacrificed to appease the gods. Redbad objects to the sacrifices and during the battle between the two tribes he manages to free his love. Aldigisl is killed and his brother Eibert (Derek de Lint) takes over as King. When Redbad is blamed for interfering with his people's beliefs he is banished from his homeland. Bound to a raft and tossed into the sea; his fate in the lap of the gods. He is washed up on the Danish shore and rescued by Frea (Loes Haverkort: Rendez-vous), the daughter of King Wiglek (S�ren Malling: Borgen). He is eventually accepted as a warrior and marries Frea, but his own people are in further danger from the Lord of the Franks, Pepijn of Herstal (Jonathan Banks: Breaking Bad), who in the name of Christianity is determined to quash every other belief in his quest to dominate Northern Europe. Despite his banishment, Redbad puts himself and his Christian warrior wife in the utmost danger by returning to his homeland to defend his people from the bloodthirsty, fanatic Franks. Distraught to discover his sister has been taken by Pepijn and, knowing how perilous it will be to enter the castle, Redbad sets out to rescue her. Rise of the Viking is a brilliantly compelling saga. Based on ancient legends and at 154 minutes might be a bit of a challenge, this movie from Holland is best experienced in two bites; we broke off for a quick lunch without realising we had already watched nearly two hours (!) before watching through to the end. The mix of some Dutch with subtitles and some English language adds an even more authentic feel to the film's atmosphere. A terrific, well constructed, gritty period drama based on ancient legends. Rise of the Viking also features: Aus Greidanus as Odulf; Peter Faber as Sibod; Jack Wouterse as Bishop Willibrod; Tibo Vandenborre as Charles Martel; Egbert Jan Weeber as Bonifatius; Mark van Eeuwen as Wulf; Birgit Schuurman as The Priestess, Renee Soutendijk as Idwina; Britte Lagcher as Sinde; Colijn Spelt as Young Redbad; and Sierd Jan van der Meulen as Baby Poppo. Music by Trevor Morris; Cinematography by Roel Reine; Writer is Alex van Galen; Producer is Klaas de Jong; and Director is Roel Reine. 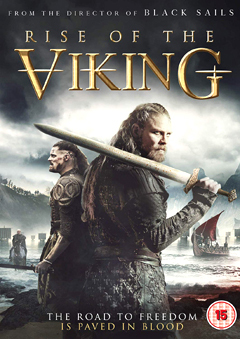 * From the Director of epic fantasy favourite Black Sails, Signature Entertainment presents the action-packed historical drama Rise of the Viking  also known as Redbad  released on Digital HD on 11 February 2019 and on DVD in the UK on 18 February 2019. Certificate: 15 | Running Time: 154 Minutes | Languages: Some Dutch with English subtitles and English.